When Chuck Ealey was a child, he picked up stones from railroad tracks that ran through his hometown of Portsmouth, Ohio, and tried to hit train cars’ small logos as each one passed. It’s no surprise that practice translated well to the football field, where Mr. Ealey became one of the best college football quarterbacks of all time playing for the University of Toledo. Jael Ealey Richardson, author of ‘The Stone Thrower,’ speaks to students at Jones Leadership Academy in Toledo. She is the daughter of former University of Toledo football great Chuck Ealey. Those stories are just a few that his daughter, Jael Ealey Richardson, shared with students Friday at the Jones Leadership Academy in Toledo. Ms. Ealey Richardson is the author of The Stone Thrower, which traces her father’s steps from growing up in a segregated community to unrivaled football success. Students in grades 7 through 11 listened to Ms. Ealey Richardson as she spoke about her father’s life ahead of Claire’s Day Festival today at the main Toledo-Lucas County Public Library in downtown Toledo. She showed clips of a documentary on Mr. Ealey produced by Canada’s The Sports Network and took several questions from the audience. Jones Leadership Academy reading coach Robin Sheffield said she chose Ms. Ealey Richardson because she appeals to many audiences. Mr. Ealey grew up in housing projects in a racially segregated city during the Civil Rights movement. His father left when he was a young boy, leaving his mother to raise him alone. She insisted he get an education, so Mr. Ealey planned to use football to make that happen. Despite hatred from opposing all-white schools, Mr. Ealey never lost a game playing quarterback for Notre Dame High School. However, college coaches wanted him to play running back. 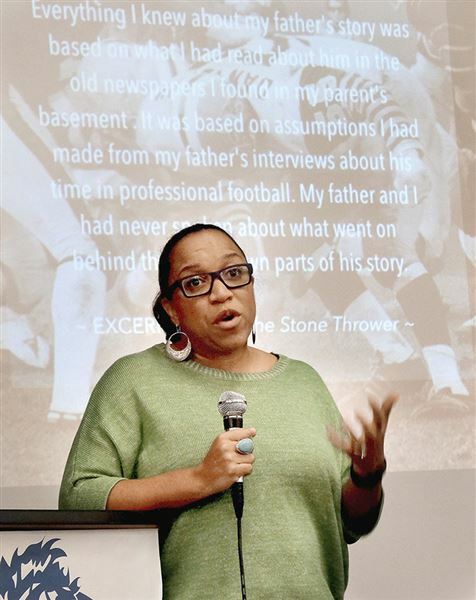 Students at Jones Leadership Academy respond to Jael Ealey Richardson, author of ‘The Stone Thrower,’ who spoke to them about the many challenges her father faced in segregated southern Ohio before becoming known for his football prowess. Toledo head coach Frank Lauterbur attended Mr. Ealey’s final basketball game his senior year, saw him hit the game-winning shot, and offered him a scholarship to play quarterback. He arrived at UT in 1968, four months after Martin Luther King, Jr., was assassinated. He took over at QB during his second year, and just like high school, never lost a game. Mr. Ealey led Toledo to a 35-0 record in games he started. National Football League teams passed on him for the same reason many colleges had: he wanted to play quarterback professionally. However, Mr. Ealey had a productive career in the Canadian Football League, and captured its Grey Cup his rookie season for the Hamilton Tiger-Cats. Eighth-grader Nia Thomas drew inspiration from the talk. Today’s event from 9 a.m. to 4 p.m. will recognize winners of the Claire’s Award for Reading Excellence, given to eight from Toledo Public Schools. Contact Jay Skebba at: jskebba@theblade.com, 419-376-9414, or on Twitter @JaySkebbaBlade.